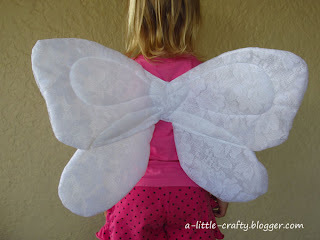 I made Miss 3 some fairy wings a year or two ago. I think they were super sweet, made out of old lace curtains with red edging. I used some wire to give the wings shape. Unfortunately the wire didn't have memory, so after a bit of playing or a car trip, the wings looked more like something that belonged to a butterfly that had been dead for a few weeks. Not that Miss 3 cared, but I felt it was time for some new wings. I know you can buy fairy wings very cheaply in the shops these days, and I know Miss 3 loves the girly pinks and purples and sparkles that they tend to come in but they're not really in my taste and, if I used things I already had lying around, the homemade option would be cheaper. 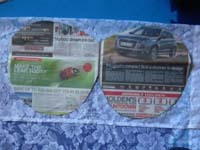 First I made Miss 3 a pair of butterfly shaped wings (with upper and lower wings). However I didn't take any photos of how to make them, because I was making it up as I was going and I wasn't sure how they'd turn out. Mr 4 then wanted to join in the fun, and so he ordered some wings with only one round wing either side. Make a pattern from paper, and cut out the shapes from your fabric (I used an old lace curtain) leaving a 1cm edge for sewing. The lace curtain was folded double for the set of wings in the left photo, and folded to 4 layers for the right set of wings. I found that wings that are roughly the size of a tabloid newspaper (double spread) to be a good size for the kids. 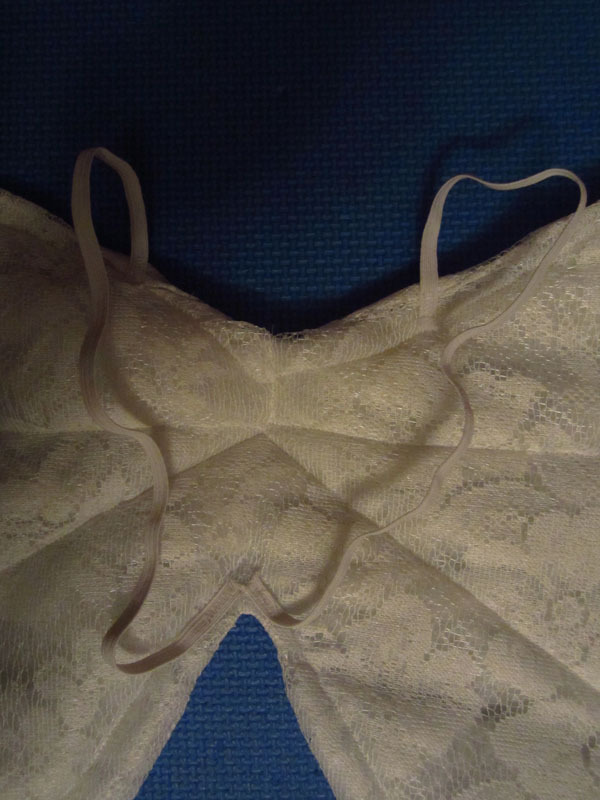 Sew the lace together, leaving a 20cm gap for turning it inside out and stuffing. Cut a piece of wadding to size. I included an extra piece of wadding for the area between the shoulders, to give a little more strength and help the wings sit flat against the back. 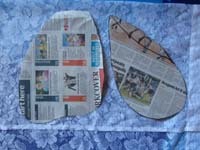 In the photo below the extra piece is a triangle, in the butterfly wings it was in a heart shape. Turn the fabric so the hem is on the inside, and push the wadding into place. 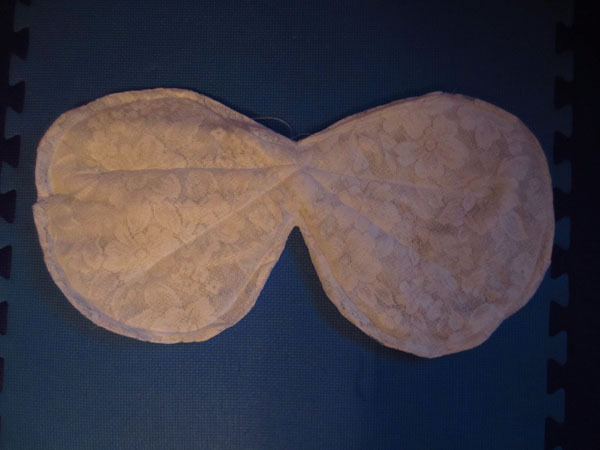 Sew the wadding in place using what ever pattern suits your fancy. I used straight lines and a rim around the edge for the wings in this photo, and some circles and tear drops for the butterfly wings. Tip: at this point I found the lace was tricky to pull into place for sewing, as it kept getting caught on the dog feed. If you put a piece of paper over the dog feed you can slide your fabric in place much more easily. Pull the paper out before beginning to sew. Alternatively drop the dog feed down while you feed the fabric into place. 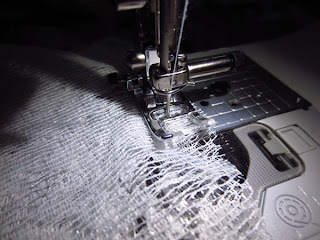 Attach elastic shoulder straps using a zig-zag stitch. At the top edge, the elastic should sit approx. mid shoulder blade for the child. 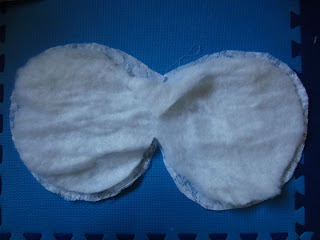 This helps the wings keep their shape (and makes it easier for the child to put them on). These wings are so soft that they can fit in the car seat, turn somersaults, and survive rest time, without getting uncomfortable or out of shape. I certainly have one happy little fairy!